LONDON — Prince Harry and his new wife Meghan Markle — now officially known as the Duke and Duchess of Sussex — appeared at their first official engagement since marrying last weekend when they attended an event in the gardens of Buckingham Palace on Tuesday. The couple, whose wedding in Windsor on Saturday was watched by millions of TV viewers worldwide, were at a party to celebrate Harry's father Prince Charles' charity patronages and military affiliations ahead of his 70th birthday this year. Also there were several emergency services personnel who were first responders after the Manchester suicide bombing exactly a year ago which killed 22 people, the palace said. Charles and his wife Camilla visited Manchester Arena last June to meet staff who were first on the scene immediately after the bombing. 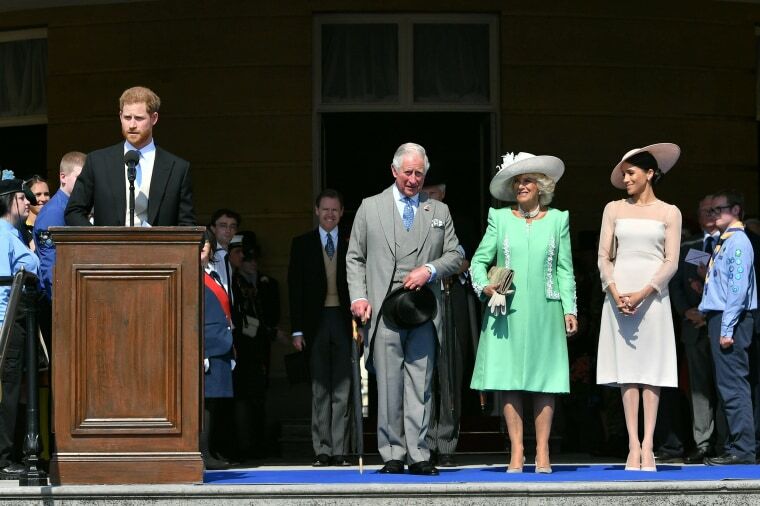 Heir to the throne Charles, who will be 70 in November, played an impromptu role in Saturday's royal wedding, accompanying Markle up the aisle in the absence of her own father who was unable to attend. Harry and U.S. former actress Markle are expected to go on honeymoon later, though no details of when or where have been announced.